Shirewood Forest Archers (SWFA) started operating from July 2013 with 6 founding members. Since then, it has been very busy running Beginners courses and Come N Try sessions on Sunday afternoons. The morning is reserved for club and/or practice shoots for members. SWFA prides itself as the first and only archery club in the Shire. 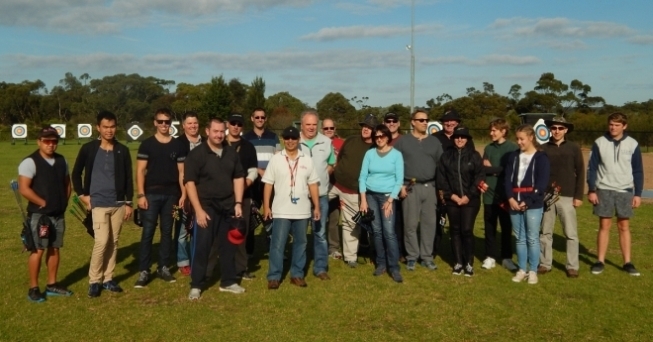 SWFA is located at the Ridge Sports Complex in Barden Ridge, set in a bushland surrounding, it is arguably one of the best sports complexes in the country, complete with a new 18-hole golf course and driving range. With permission granted by the Council, Illawong Athletics were kind enough to share with us their lower Athletics Field used for long jump and shot put. It is fully fenced, facing south for shooting direction, 50M x 100M, bounded on 3 sides by bushland, and on the left side by a lawned slope which will ideally serve as a spectators stand. Facilities include an operations room/clubhouse, toilets, showers, shelter and plenty of parking. Club events are held on Sundays. The shooting range is usually available during the week for practice when not being used by Athletics. The range can take a maximum of 12 targets at 3 metre lanes. Maximum shooting distance is 90 metres. As of late September 2018 - Shirewood Forest Archers can now accept Active Kids vouchers towards membership (only) with our club - please contact Andy for more details - 0430 041 221. The person who increased their handicap the greatest number of times. The person who shot the greatest number of x’s for the year. For Past League results - please click on the Results option at the top of this page.